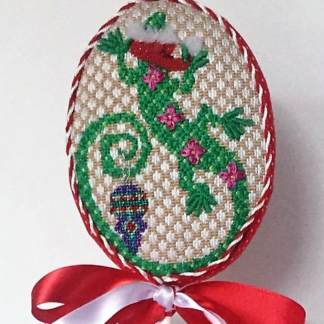 Lora Lee Lizard is a modern, fun needlepoint ornament. 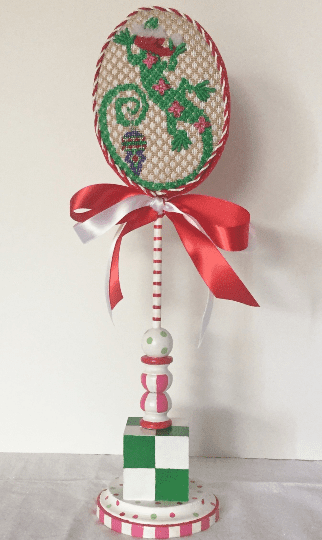 Picture it as a hanging ornament, or as stand up Christmas decor. 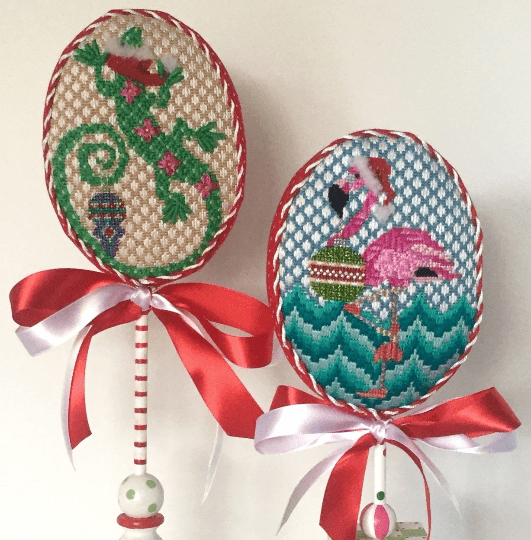 Lora Lee is bright and colorful, and she is a lot of fun to stitch! This modern Christmas design is painted on 18 count mono canvas. Overall design measures approximately 4″w x 5 1/2″h, with a minimum of 1 3/4″ of blank canvas on all sides. I would be happy to create the same design on 14 count canvas, if you prefer. Keep in mind that the overall size will change a bit. I paint every canvas with great care and focus. I stitch paint every canvas as well, to make stitching even easier for you. A stitch painted canvas means you get the accuracy of a counted design, without the counting. With a stitch painted canvas, all color changes are clear and distinct (no gradual shading from one color to another) and perfectly fit the weave of the canvas. Stitch painting takes a bit more time, but I think it’s worth it. 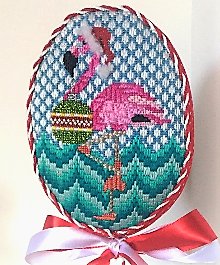 I designed Lora Lee to accompany Flamingo Holiday (aka Felicity). As with Felicity, Lora Lee is wearing a red Santa hat with fur trim. Lora Lee is bright green with pink flowers covering her back. 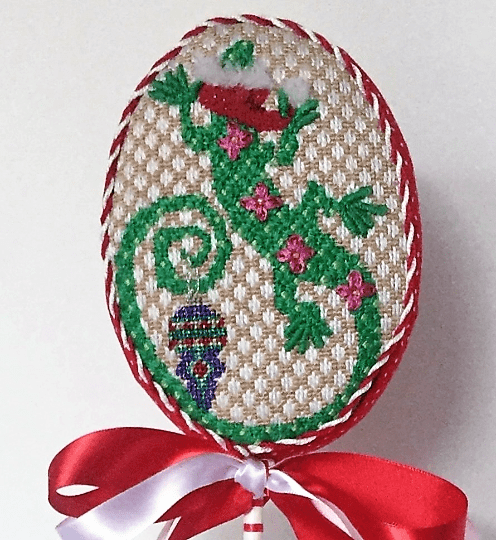 A sparkling ornament dangles from her tail. I painted the background in a honeycomb design, representing tiled wall. This is another quick-stitch canvas, and an ideal piece for decorative stitching. Lora Lee is perfect on her own, but she and Felicity stitch up as really fun holiday combo. 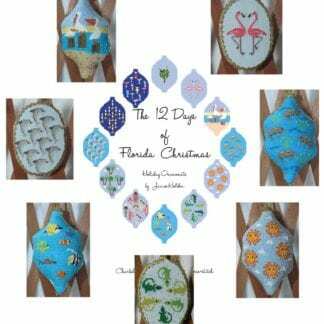 Finish both canvases as ornaments or stand up decorative accents. 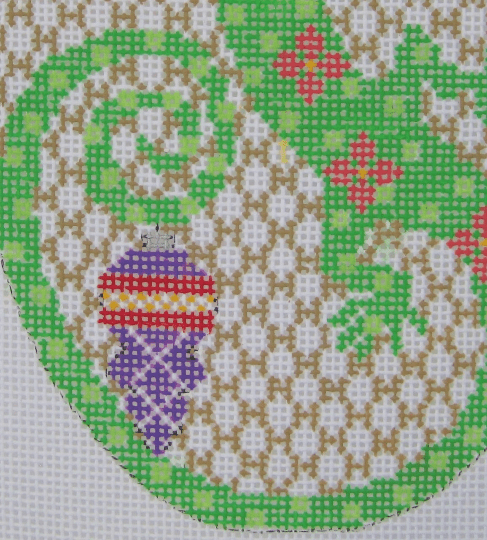 Use the tent stitch to complete the canvas, or try your hand at decorative stitching with our available stitch guide. I really enjoy developing stitch guides. I love trying out new stitches while stitching canvases, finding just the right ones for each area. 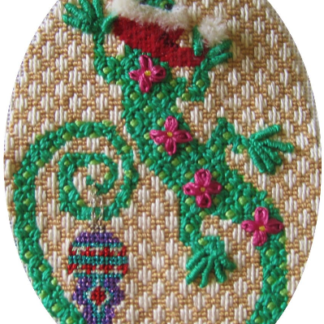 The Lora Lee Lizard stitch guide walks you through every stitch with clear stitching charts and easy to follow instructions. 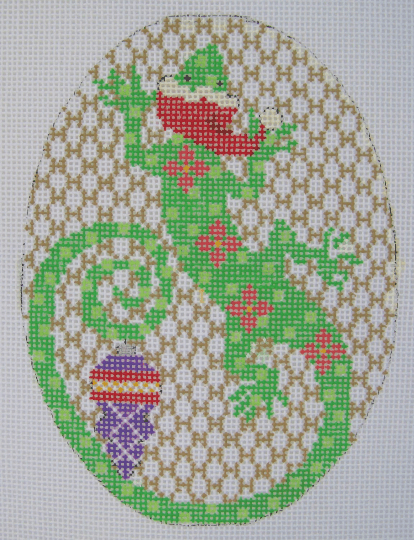 Stitch guide is available for purchase as a PDF download HERE. 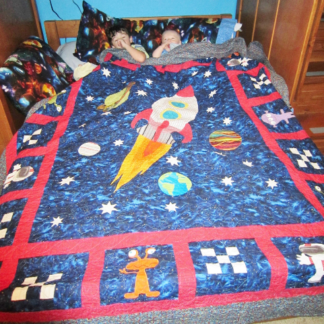 Your made-to-order canvas will be ready to ship as soon as possible, but please allow up to 4 weeks. I hand-paint each and every order myself, and I want to ensure enough time to provide you with excellent quality! I’m happy to customize these designs if you prefer different colors, or create a new original canvas for you. Just send me a note!